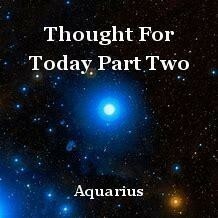 The continuation of 'Thought For Today - Part One'. What's Behind Good And Bad Character Traits? What Is The Fear Of Death? Why Is There So Much Disappointment In Human Relationships? Why Is Thought The Most Powerful Force Of All? How Does One Tell A Truth From A Lie? Don't You Know What Religion Means? How To Attract More Love? Who Is Everybody's Dream Lover?